This afternoon, the State Department released its Supplementary Environmental Impact Statement (SEIS) on the controversial Keystone XL (KXL) pipeline, claiming that the pipeline will “not likely result in significant adverse environmental effects.” The SEIS paves the way for President Obama’s approval of the pipeline despite widespread concern over the climate impacts of tar sands oil. The State Department assessment does acknowledge that excavation of the Canadian tar sands oil would result in 17% more climate change emissions than the average barrel of heavy crude oil. But the report continues to say that the KXL pipeline would have no adverse impact on climate change because if the pipeline were not approved, companies would ship tar sands oil via railroad. For more breaking news on the Keystone XL decision, see DeSmogBlog’s live blog here. As the death toll rises following a pipeline explosion in Kenya, the proposed Keystone XL pipeline awaits final approval in the United States. 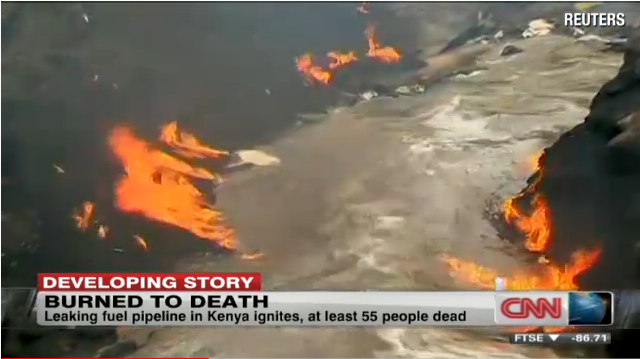 Initial reports out of Nairobi say at least 68 residents of a densely populated part of the city died after Kenya Pipeline Company workers failed to contain a leak. The concern in the United States is that this disaster could become commonplace once TransCanada’s Keystone XL expansion is put into place. While the Kenyan explosion is the first of its kind in the unstable nation, it is the tenth reported explosion in the African continent since 1998. Most of the reported incidents since 1998 happened in Nigeria where an estimated 2,000 lives have been lost because of pipeline related accidents. Still, the number of explosions in Africa over the last 13 years is far fewer than the number of pipeline accidents in reported by TransCanada’s existing Keystone pipeline in the past year alone. That number happens to be 12. Other reports reveal that between 2010 and 2011 nine different explosions in the United States caused 18 deaths, 13 injuries and 85 destroyed homes in the United States. Nearly a week has passed and thousands of gallons of crude oil have poured into the Yellowstone River in Montana. The spill has placed attention on America’s often overlooked and aging pipeline system. As the media continues to cover ExxonMobil and its ruptured pipeline, here are a few things to consider about pipelines in the United States. Over the last eighteen months the United States has seen a steady flow of pipeline accidents that have resulted in the spilling of millions of gallons of oil, the destruction of homes from coast to coast and several deaths and injuries. Between January 2010 and February 2011 nine major pipeline explosions resulted in 18 deaths, 13 injuries and 85 destroyed homes in the United States. A full list of all pipeline accidents in the United States, including the Yellowstone River incident, can be found here. The list also includes the estimated 800,000 gallons of crude that spilled into the Kalamazoo River last year, as well as the 600,000 gallons of crude that made it into a Chicago suburb just months later. Both spills were the result of pipeline failures. The management of pipelines is a bureaucratic nightmare. Six seemingly unrelated federal agencies, including the Department of Transportation, Mineral Services Management and U.S. Army Corp of Engineers, have a share in the responsibility as the Agencies of The Joint Pipeline Office dealing with concerns over safety, regulation, transportation and access of oil and gas from interstate pipelines. The agencies are responsible for thousands of miles of aging pipelines, some of which have been around since the 1860s. Yet, spills continue to happen causing leaks into our precious natural resources. In the wake of the Yellowstone River spill, ExxonMobil is increasingly going on the defensive for not telling the truth to federal officials and Montana Governor Brian Schweitzer. The Associated Press reports that an ExxonMobil said the oil spill had been contained within 30 minutes of the rupture. That reports shows that it was actually nearly an hour before the pipeline had been fully turned off. This was not the first discrepancy between ExxonMobil’s rhetoric and the reality of the Montana disaster. Before giving federal officials and Schweitzer false information about how long crude flowed into the Yellowstone, ExxonMobil had been sticking to their story that ten miles of the Yellowstone River could be affected by the spill. By the time Schweitzer spoke on television on Tuesday night, the governor knew that the dynamics of the flowing Yellowstone River meant that ExxonMobil’s ten-mile claim was bogus. “At seven miles per hour, some oil is already in North Dakota. That’s a given,” Schweitzer said. That same day, the same transportation officials who were told that oil wouldn’t go beyond a ten-mile stretch, acknowledged that oil had been observed in Terry Montana, more than 240 miles downstream. The Yellowstone River disaster comes at a critical time for America’s pipeline and energy industry. The Secretary of State’s office is currently considering approval for what would be a major pipeline that would connect crude oil reserves in the Alberta Tar Sands to refineries in the United States. This proposed expansion of the existing Keystone pipeline has raised concerns for several reasons. 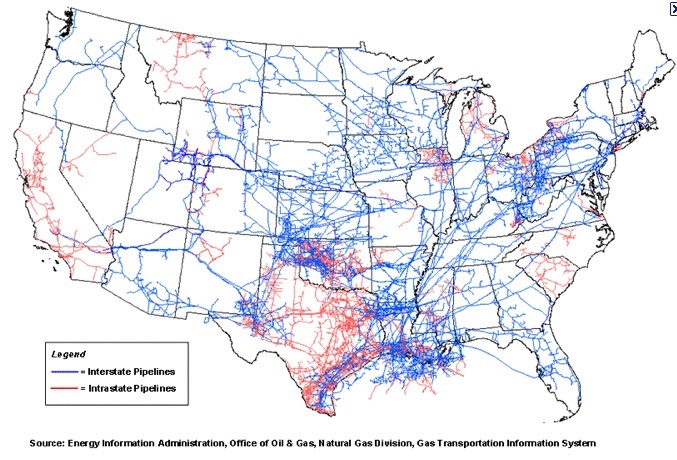 First, the pipelines will come close to existing waterways and aquifers. Modern pipelines can be buried as much as 25 feet beneath bodies of water; Exxon Mobil’s Silvertip line was 5 to 8 feet below the bottom of the Yellowstone. In Nebraska, several state legislators have expressed concerns that if a disaster like the spill in the Yellowstone River were to happen near the Oglala Aquifer, the damage done to a critical water supply to one of the nation’s leading agricultural states could be catastrophic. The same concern has been echoed by Nebraska’s two United States Senators who despite being members of different political parties, are both skeptical of the project’s potential harm to drinking water. Of course this raises the question of the likelihood of spill from an expanded Keystone XL pipeline. According to a report by the National Resources Defense Council, spills from the existing Keystone XL pipeline occur at a rate of about one per month. Over the last eleven months eleven spills have occurred at pumping stations along the pipeline. This includes a May 7 spill of 500 barrels in North Dakota, which sent a geyser of oil spurting 60 feet into the air and shutdown the pipeline for a week. Another reason for concern surrounding plans to expand the Keystone XL comes down to ties between Secretary of State Hillary Clinton and TransCanada. 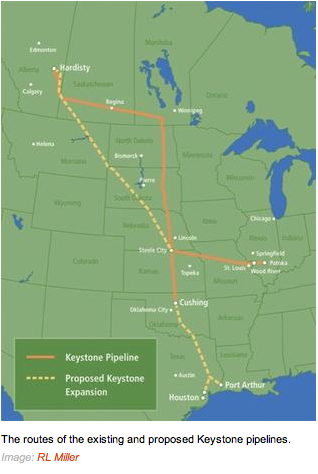 TransCanada is the company that owns the existing Keystone XL pipeline. TransCanada’s main Washington, DC lobbyist is Paul Elliot, who served as the Secretary of State’s national deputy director for her failed presidential run in 2008. This cozy relationship has resulted in several organization filing requests to see the discussions between Clinton and Elliot throughout this process. Currently, the Secretary of State’s office is in the review stages of the approval process for the pipeline, which if given the go-ahead would allow for 900,000 barrels of crude to be pumped into the United States every day. Not only does ExxonMobil make $5 million per hour, the company is a beneficiary of $21 billion in tax breaks (over the next five years) to the top five oil corporations. ExxonMobil will mostly be able to write off the clean up costs as a classic business deduction. Like Americans did during the BP spill (which reportedly cost $5 billion to clean up), they will accrue most of the financial costs of this leak. And who knows how much the tab will end up costing this time.